Wee Rock Learning Center in Harrisonville, Minnesota was inspired to start a workplace wellness activity. They participated in “Taking Steps to a Healthy Success”, which prompted the initial activities, but they made it a goal to continue with the healthier changes since they were seeing benefits. Tuesday: The staff was provided a healthy lunch that included grilled chicken and a salad made from Brussels sprouts. The recipe and nutritional information for the meal was provided. Wednesday: Instead of a regular cookie, a healthier chocolate chip cookie was given out. Thursday: The staff made stress balls with materials provided and information on stress management was presented. Friday: Adult coloring pages and colored pencils were given to the staff, and they learned about the benefits of adult coloring. 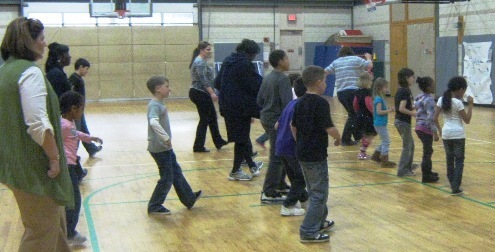 To continue with staff wellness, exercise options were shared for them to do on their break. Regular information on various health and wellness topics were also provided. The center leadership received feedback and direction on the type of information the staff will find useful in the future. Child care provider, Cindy Payne, believes that participating in wellness activities models healthy choices to the children in their classroom. “It is important to all staff to have a positive influence on the children and their families to make healthy choices,” Payne shared. First Years in the First State — Improving Nutrition & Physical Activity is a toolkit developed by Nemours’ Health & Prevention Services (NHPS) for the Delaware Department of Education and funded by a U.S. Department of Agriculture (USDA) Team Nutrition grant. Suitable for any ECE setting, it includes self-assessments, menu plans, recipes, shopping lists, budget-saving tips and more.